Two months ago my husband and I decided to go for a run in a park a few minutes away from the house. I still remember that morning as if it was just yesterday. I took my GPS watch so that we could measure the distance we would go. The area was really more of an oval but truth be told, I wasn’t able to measure the entire distance as we stopped around half way through. My husband was out of breath – after 190 meters. The next day we ran the entire oval then walked another round. Little by little we would progress around the oval until one day we could do three or four rounds without stopping or heaving for breath. Sometime in mid-December we agreed that we would have a goal, and that was to run in the Color Run that would be held in the Sydney Olympic park in February. So off we trained, a few extra hundred meters at a time until we were running the five kilometers maybe three or four times a week. My brother, who runs marathons as a pastime told us that “one day, running the five kilometers will come so easily that it will feel like nothing…” that day, was clearly not going to happen anytime soon. We would finish each run, muscles sore, sweating profusely and trying to catch our breath. There were days when we would feel like sleeping in but we would try to motivate each other with little quotes like “there will come a day when you will not be able to run… today is not one of them” or when it was rainy we would tell each other that “there was no such thing as bad weather, only inappropriate clothing”. The Color Run is a five kilometer run loosely based on the Indian Holi festival. Everyone starts with a white T-shirt and each kilometer is associated with a designated color. As you run or walk (or dance) each kilometer, you are blitzed with color so that by the end of it, you look like some sort of colorful grunge art piece. There is a reason that the Color Run is called the happiest five kilometers. The event itself was truly amazing. There were over 20,000 who participated and needless to say running through each color zone definitely made the run more fun. But what really inspired and motivated me was crossing the finish line with my husband. Here was someone who could barely run 200 meters just two months ago and was now finishing his first run. Something he never (ever) thought possible. This salad was a recipe given to me by my Aunt Jenni. I am not sure what the origin of the salad was but I think one of her friends gave it to her. We used to call it the Qantas salad because someone said they used to serve this as part of the first class meals (I have never ridden first class so I can’t confirm). In any case, I’ve renamed it the Color Run Salad in honour of our first run together. 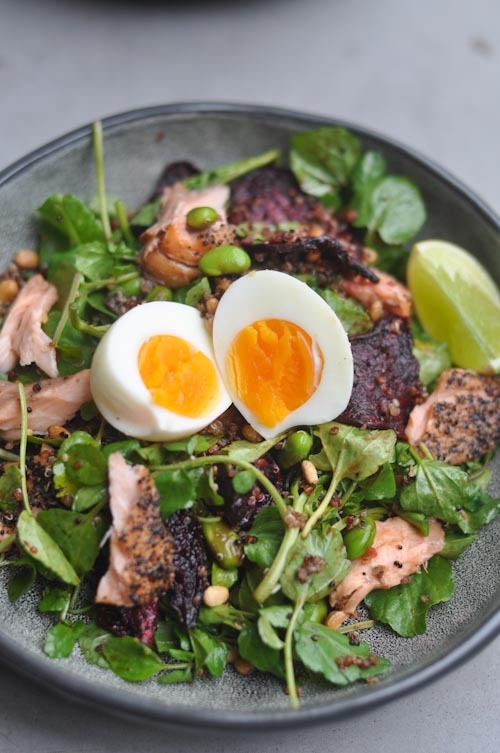 It’s as tasty as it looks beautiful and it’s healthy too! Preheat the oven to 180c. Peel and cube the pumpkin, sweet potato and beetroot into cubes. Toss with the olive oil, mixed herbs and season with salt and pepper. Roast the vegetables in the oven for around 25 to 30 minutes or until cooked through. Remove from oven and allow to cool. 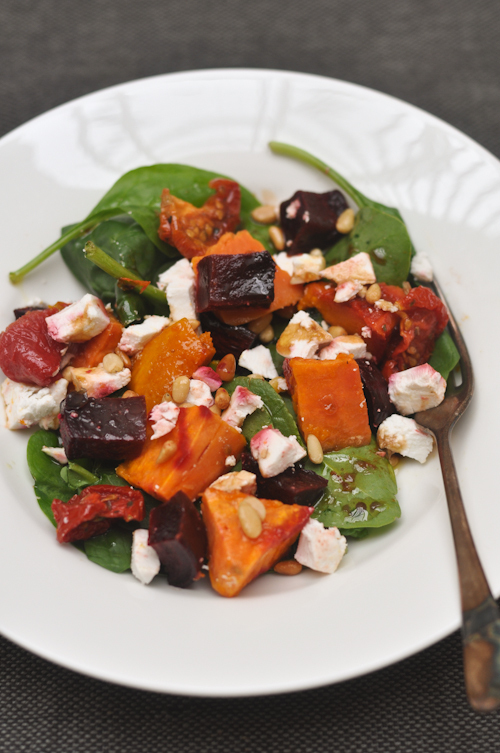 To serve, combine the roast vegetables with the pinenuts, feta and spinach/rocket leaves. A few weeks ago I was chatting with a group of friends over Whatsapp when we received a message from my sister. She was disturbed to discover that her son, not quite two years old, had started saying the “F” word. Of course, all of us, (not being the highly principled and responsible adults we should have been) thought it was cute and asked her to take a video and send it to us. While my sister’s first reaction was worry that he was going to get kicked out of day care, I thought it was quite amusing. I remember when my Mom first told me about my other nephew had learned a few bad words from some friends at school, he was probably around three then. I pulled him aside one day and whispered to him to tell me what bad word he knew. He said a few curse words and we had a good laugh over it. After that, I told him never to repeat it again. I haven’t heard anything like that from him since. The thing with kids is that they eventually learn to use their judgement about what they can and can’t say… sometimes even better than adults. I read this article the other day about how parents react differently to use different strategies to curb the use of swear words. Some will ignore, others will explain to them what they’ve said is inappropriate and others will ban the use of certain gadgets like the ipad. In my sister’s case, I’ve noticed she’s also taken to substituting swearing for other words. Now I hear her say “Far out!” and it’s also rubbed off on me. Her husband though, I think he is in denial. The other day he took my nephew over to say hello. As we were chatting, my nephew was running around the house saying, what to me sounded like “F@$k”. “What did he say?”, I asked his father. The next day I went to the butcher to get a few duck breasts, no doubt inspired by my nephew’s expanded vocabulary. 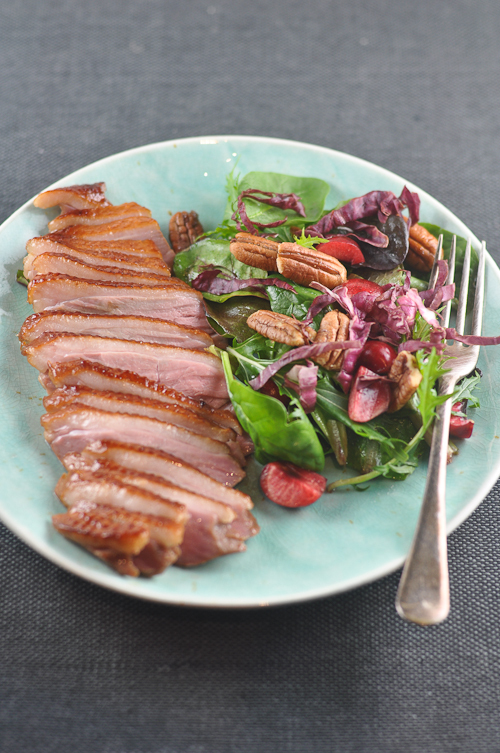 No recipe this time, just a few notes on how I prepared the duck. First, I marinated them in a maple/soy sauce mixture. Two tablespoons of maple syrup and three tablespoons on light soy sauce, allow to marinate for around 2 hours. Then the duck breasts were vacuum sealed and placed in a water bath. I am loving my new sous vide machine which allows me to make the most tender duck I’ve ever tasted. 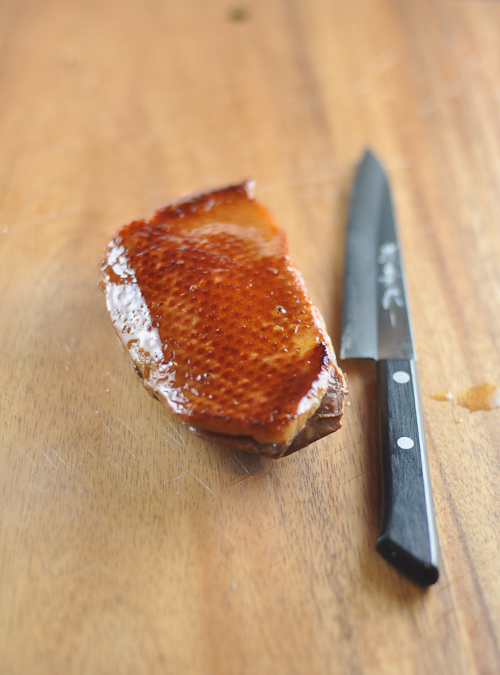 I cook the duck breasts at 57c for an hour and they come out amazingly tender every time. After, I smoked them using my second favourite kitchen gadget, my stove top smoker. This is a twenty plus year old machine donated to me by my Mom. I smoked the duck breasts using hickory sawdust over a low temperature for 15 minutes. Finally, the duck breasts were pan fried to get the skin all nice and crispy. 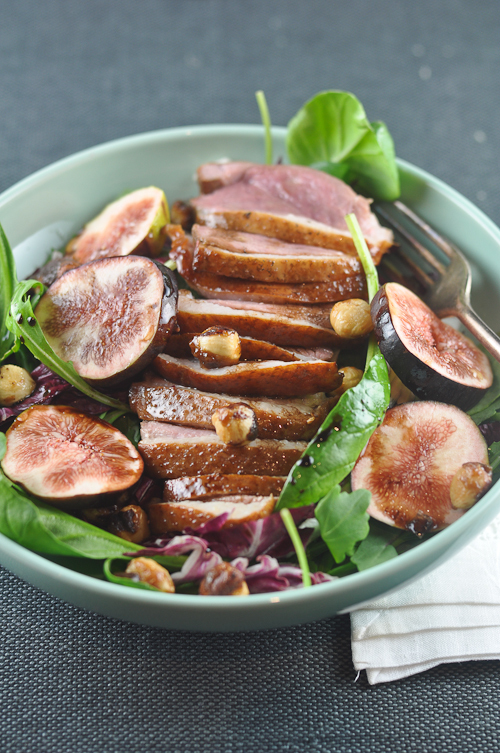 The duck can be served in so many ways. Sometimes I have with as a salad. My two favourites are with some mixed greens, candied pecans and cherries over a vin cotto dressing. I also like it with figs, and hazelnuts. 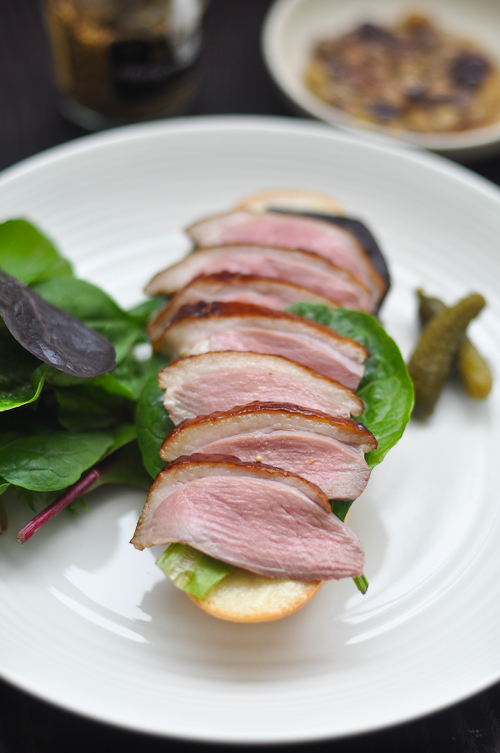 The duck breasts are also amazing on a sandwich. 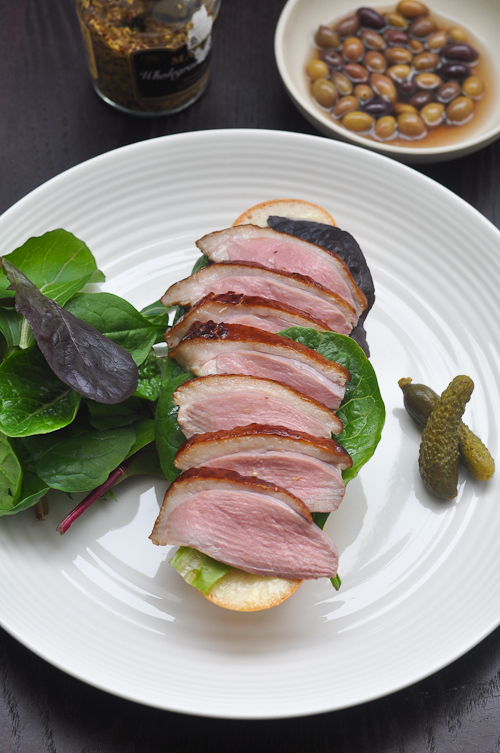 Imagine the most meltingly tender duck breast, crispy skin and a hint of hickory over a crusty baguette spread with some butter, mustard and mayonnaise. Far out! 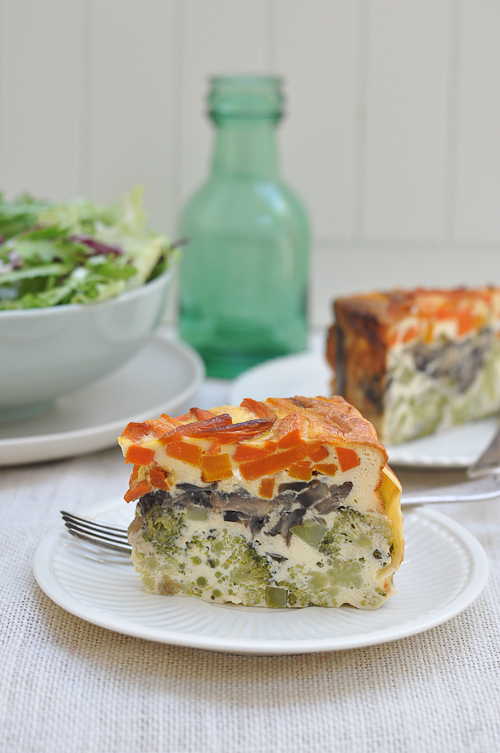 Vegetable Cake… Would Julia Like It? Dinner parties hosted by my family are a curious thing. I grew up with a Mom who prepared for them with the same enthusiasm that sportsmen would train for the Olympics. She would spend weeks planning and revising elaborate menus with no less than six or seven courses to be served. Because we had a restaurant, it was easy for her to borrow some of the cooks to help out. She would set up “stations” at different areas of the house. One time there could be a grilling section where steaks were cooked to order for the guests. Another station could be the carving station where she would serve maybe a suckling pig, or a turkey and a ham. Inevitably, the night would also end with a post-dinner commentary among ourselves about how the dinner went. The assessment would go at length about whether the guests enjoyed the food, who went back for seconds (or thirds), who wore what, and god forbid, who didn’t show up when they said they would. Then the wrap-up would end with a critique on what could be improved on for the next party.